As a blogger, you may have come across news recently that Google have updated their guidelines regarding no-follow links when working with brands and businesses, in particular receiving goodies for free in exchange for a review. That’s all well and good, but what if you don’t know what the bloody hell a no-follow link is?! Though I am by no means an expert, I’ve helped a few of my fabulous blogger friends grasp how it works, and so today I will try my best to help you too. 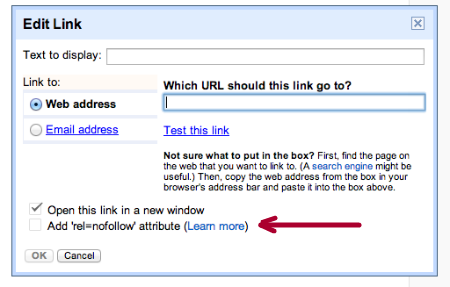 What exactly is a no-follow link? Whenever a website is linked on a blog or any other spaces on the web, Google “follows” this link to find out exactly where it leads to, and takes into account the links when ordering search results. So, for example, if a website is found to be linked from a lot of various webpages talking about llamas, Google starts to think “Hey, this must be a pretty popular website for those looking for llama information!“, and thus the website is bumped up in the search results list. A no-follow link does what it says on the tin basically – it stops Google following the link and taking it into account for search results. When should I use a no-follow link? Bloggers should use the nofollow tag on all such links because these links didn’t come about organically (i.e., the links wouldn’t exist if the company hadn’t offered to provide a free good or service in exchange for a link). Companies, or the marketing firms they’re working with, can do their part by reminding bloggers to use nofollow on these links. So the question arises: what if the company never actually asked for links in your review, and you’re simply linking them because you genuinely want to recommend the product? This part comes down to you. I personally also stick to no-follow links when I’ve been sent something for free to review – I would rather be safe than sorry! If I happen to recommend the product again in the future off my own back, maybe in a gift guide or a wishlist, then I can safely use a standard link. It’s also worth mentioning here that Google also asks you to disclose sponsored posts with your readers. I do this with a little sentence at the end of the post, as well as following any free products I receive with an asterisk (*). What can happen if I don’t use a no-follow link when I should? In terms of the bigger picture, you may not need to worry about it too much. After all, these are guidelines and not laws. You won’t be getting a fine or a prison sentence for it. Your website can really suffer though. Google is really trying to clamp down on links that are paid for or non-organic, and they can take action by demoting your website in their search results, removing your page rank (a measure of a webpage’s reliability and authority on the web), or Google may even decide to remove your website from their database entirely, meaning you’ll lose any traffic you normally receive from Google searches. How do I make my link a no-follow link? See? Not too difficult at all right? If you’re using Blogger for your webpage, you have it even easier, because they’ve introduced a handy little check box that lets you make your link a no-follow link with a single click. When adding a link to your post on Blogger, you are greeted by a pop-up box where you input the info you wish to use. Towards the bottom, there is an option to add the no-follow attribute. Check the box, and you’re done!